After graduating from OSU, Nicole Winnen, registered pharmacist, purchased Mac Prescription Shop in 1999. She took over the reins from pharmacist Gail Johnson and his partner pharmacist Fred Parkinson, Nicole’s father, who opened the business in 1970. Since then, Nicole, with the help of her husband, Jarod, has been very busy! In addition to raising three children who attend Memorial Grade School and Patton Middle School, and who are heavily involved in many sports and other activities, they have grown and maintained a thriving business. Mac Prescription Shop was remodeled and expanded in 2002. 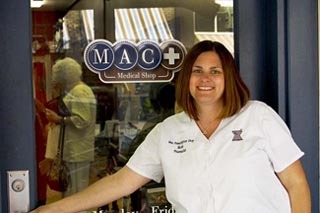 In 2009 Mac Medical Shop was opened across the street to expand their offerings of home medical equipment. At the end of 2012, an additional pharmacy location was opened at the new Physician’s Medical Center location, aptly named, Mac Prescription Shop at PMC. This location’s primary goal is to serve clinic and hospital patients as well as those patients living in the areas east of McMinnville. Mac Prescription Shop’s two locations are the only locally owned and operated pharmacies in McMinnville. Nicole employs over 20 local residents whose focus is on giving superior customer service to our valued customers. Our pharmacies specialize in solutions to help patients with compliance such as Medication Synchronization Services, Medicine-On-Time®, Adherence Packaging, and Medication Therapy Management. We service long term care residents in group homes and other long term care facilities. Since 1970, Mac Prescription Shop & Gifts has been providing local communities in the McMinnville, Oregon area with prompt and friendly pharmacy services. From prescription to over the counter medications, we have it all. And, we offer specialized packaging of medications for easy dispensing. We also sell personal care products and vitamins. Our pharmacists provide medication therapy management to any customer in need and are happy to answer any questions you may have about your medication. So, if you’re looking for one-on-one, personalized customer service from a knowledgeable pharmacist, stop by one of our two convenient locations today. Or, call 503-472-2146 or 503-472-2148 to take advantage of our automated refill system.